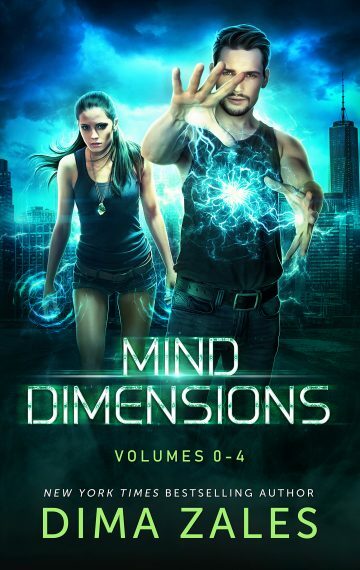 All 5 books in the popular Mind Dimensions series from a New York Times bestselling author. Over 1500 pages of thrilling action, adventure, and unique mind powers. Darren’s always known there’s something wrong with him, but he’s learned how to make the most of it. After all, graduating Harvard early, landing a dream job, and getting filthy rich is easy when you have the ability to stop time. What isn’t easy is figuring out how he got these strange powers, or if they’re even real. Darren thinks he might be crazy—until he meets her. Mira can also stop time, and she’s the key to unraveling Darren’s past. The only problem? She wants nothing to do with him. But when Darren gets caught in the middle of Mira’s secret revenge mission, the two must work together. Drawn into Mira’s dangerous, hidden world of Thought Readers and Pushers, Darren discovers that his powers go deeper than he could’ve imagined… and that a dark past threatens his new life. With new enemies out for blood and a secret that could turn even his closest friends against him, can Darren master his new powers in time to save himself? NOTE: This set contains a novella and four full-length novels – The Time Stopper, The Thought Readers, The Thought Pushers, The Enlightened, and The Elders.